Home	→ Blog → LACE FRONTAL WIGS → What is different of 360 lace wig and full lace wig? What is different of 360 lace wig and full lace wig? Welcome to Layla Hair – one of the leading lace wig suppliers in Vietnam. Nowadays, wigs and hair extensions are becoming the popular ‘tools’ to make beauty. They are especially the range of products about lace wigs. In Layla Hair, all kinds of lace wig such as 360 lace wig, full lace wig, frontal lace wig, 4×4 lace wig, 5×5 lace wig, … are available. Some of them are still strange phrases with many people. 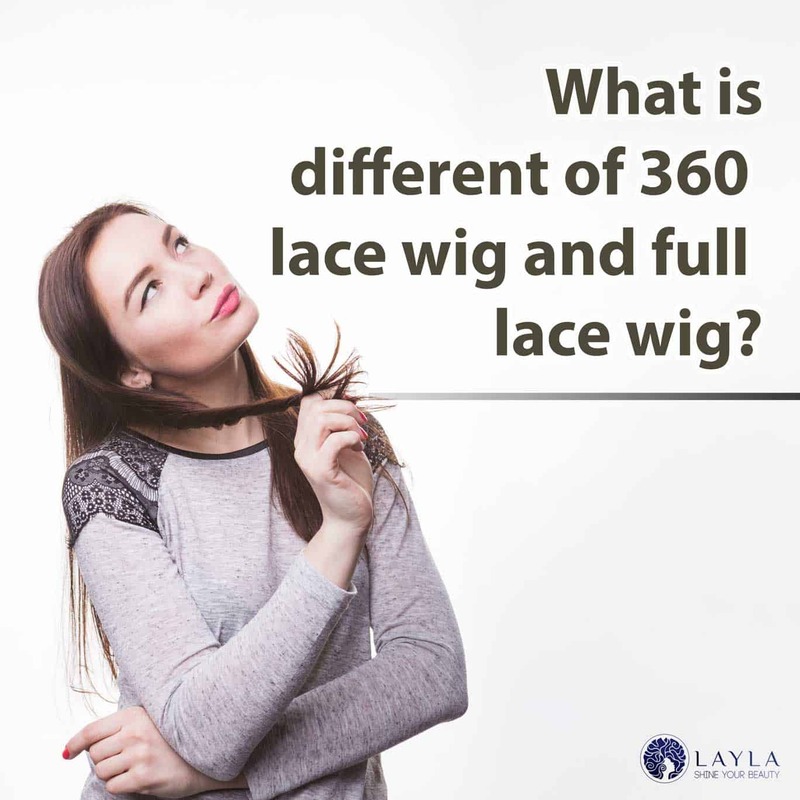 Today’s post will tell you the difference among them and find out 360 lace wig thoroughly. 360 lace wigs as well as other lace wig become more and more popular with ladies all around the world due to their convenience(easy to apply), high quality, affordable price. However, many our customer know lace wig. But they don’t distinguish the difference between them and even mistake 360 lace wig for full lace wig. In order to help you make a decision accordingly when buy lace wigs, this post will answer the question: “What is different of 360 lace wig and full lace wig?” and give you some information about other kind of lace wig. 1 What is 360 lace wig? 2 What is full lace wig? With each lace wig, I will give some details to you and define about it accurately. Now start with 360 lace wig – one of the outstanding products at Layla Hair. First of all, you can visualize a bit about 360 lace wig when we pre-sew the 360 frontal and bundles into a wig. It is neither full lace nor lace front, which is with lace round. 360 lace wig is with more wefts at top of lace cap, whole wig density may be usually 150% or 180%. Because there is lace in the front edges of the piece and these are cut off just before being placed on your head, it looks like natural hair line. Do you recognize different something? So, let’s go to the next part to see the features of full lace wig! Full lace wig is one of the most versatile wig ever created. A full lace wig is made from a lace cap that covers the entire head and 100% real hair which is knotted into manually. Full lace wigs also have an additional stretch cover in the central part of the wig to protect the lace. With this wig, it is versatile to part hair line following what you want like a middle parting, side parting, a middle and side parting, etc. The disadvantage of full lace wig is easy to shed and more difficult to apply than 360 lace wig. Now, make a particular comparison between full lace wig and 360 lace wig. With a 360-surround base and impressive thickness, it bring a natural and charming look for every women, especially special occasions. Suitable for active people who work all day and want the most natural look. We has answer your wonder about two kinds of lace wig which are mistaken at ease: 360 lace wig and full lace wig. However, I think you need to know other kinds of lace wig like frontal lace wig, 4×4 lace wig, 5×5 lace wig to make a choice properly. At this moment, I just give you some general information about them. Frontal lace wig is hand-knotted strand by strand in the front portion which is 13×4; ear-to-ear coverage at 4 inches; best choice to part the hair in any direction you want. 4×4 or 5×5 lace wig refers their sizes, therefore, you have many opportunities to select proper one. Beside 360 lace wigs, many articles about full lace wig, frontal lace wig, 4×4 lace wig, 5×5 lace wig posted on Layla’s blog that you can consult. If you have any question, you can contact Layla Hair’s staff . We will provide you suitable information that meet your inquiries. After know the difference of 360 lace wig and full lace wig, I hope you can choose and buy lace wigs smartly. 360 lace wig can be a great option, but this doesn’t mean that you may not buy other kinds of lace wig. If it is suitable for you and make you shine and become more confident, don’t hesitate to purchase one. Now, click our website(http://laylahair.com) or contact us by WhatsApp((+84) 989 633 424) to order a 360 lace wig!